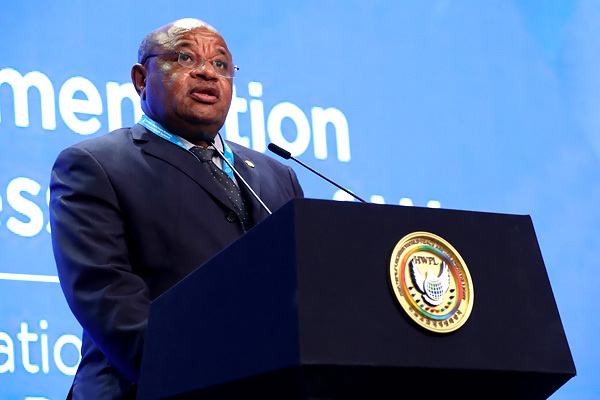 In August, two African countries, eSwatini and Seychelles, officially proclaimed the National Solidarity Statement for the promotion of the DPCW. This is only one example of the results of the efforts made by the peace messengers from around the world who are currently working with HWPL. More than ever, the peace messengers have been active this year in advocating for the DPCW to be adopted within the UN. In addition, the international community has also joined the work in support of sustainable peace being achieved through the core principles of the DPCW. So, it can now be seen that the realization of the DPCW as an international law is much closer than before. 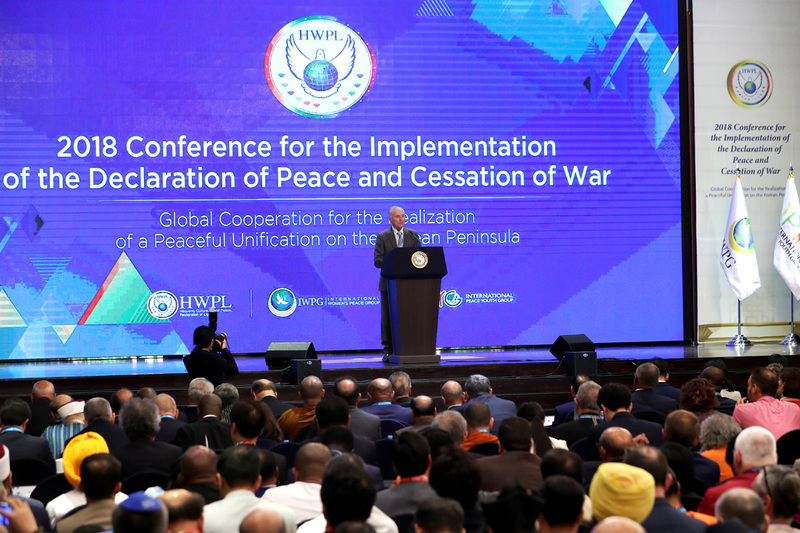 The ‘2018 Conference for the Implementation of the Declaration of Peace and Cessation of War’ began with HWPL’s report on the activities conducted over the past year and continued with a special focus on the direction of future activities for the adoption of the DPCW as a UN resolution and the role of the entire civil society in the peaceful unification of the Korean Peninsula. This conference was attended by around 650 participants, including former and current presidents, government officials, civil society leaders, and heads of youth and women’s organizations, who have a strong desire to achieve the goal of the realization of peace in the global community. All participants greatly applauded HWPL’s performance and the concrete plans that were shared. 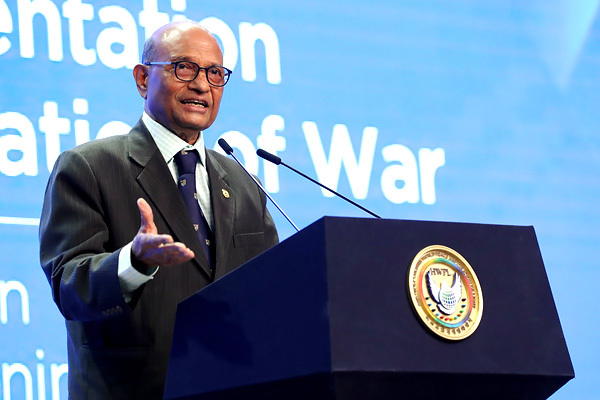 The DPCW, comprised of 10 articles and 38 clauses, has been presented as the fundamental solution to the many conflicts currently raging around the world. Above all, it securely blocks the possibility of war at its source through its core values that guarantee the realization of sustainable peace. Mr.PravinH.Parekh, President of the Confederation of Indian Bar and HWPL International Law Peace Committee Chairperson, presented the current status and plans regarding the process of the DPCW to be submitted to the UN. He explained, “Today one country saying ‘yes, Chairman Lee I accept your declaration’ is not enough, even 10 countries saying this is not good enough. Therefore, we need the United Nations. That is the effort Chairman Lee had been doing and we should all support Chairman Lee in ensuring that this becomes a United Nations document,” calling for active support from all participants in attendance. H.E. Mohamed El-Amine Souef, Minister of Comoros, Ministry of Foreign Affairs and International Cooperation stated, "Today, the Union of the Comoros has just signed the Declaration of Peace and the Cessation of War to mark and support the efforts of the HWPL Peace Summit," presenting Comoros' statement of official support at the national level. H.E. El-Amine Souef added, "This Declaration, which we have signed, is a necessary vehicle for the cessation of world wars and will be transmitted to the United Nations General Secretariat. The relevance of this Declaration is consistent with this, as the very preamble of the Declaration is intended to maintain international peace. Security and peace must set the stage for the promotion of a world without war, and clear the ills, poverty, insecurity and despair," stressing that the dream of building a sustainable world peace must come true. H.E. Gennady Burbulis, Former State Secretary of Russia and President of Baltic-Black Sea Forum, declared support for the DPCW on behalf of the Baltic-Black Sea Board of Directors. The Baltic-Black Sea Board of Directors is a political forum organization consisting of 11 members that actively discuss ways to resolve disputes in Eastern Europe and the Baltic region. 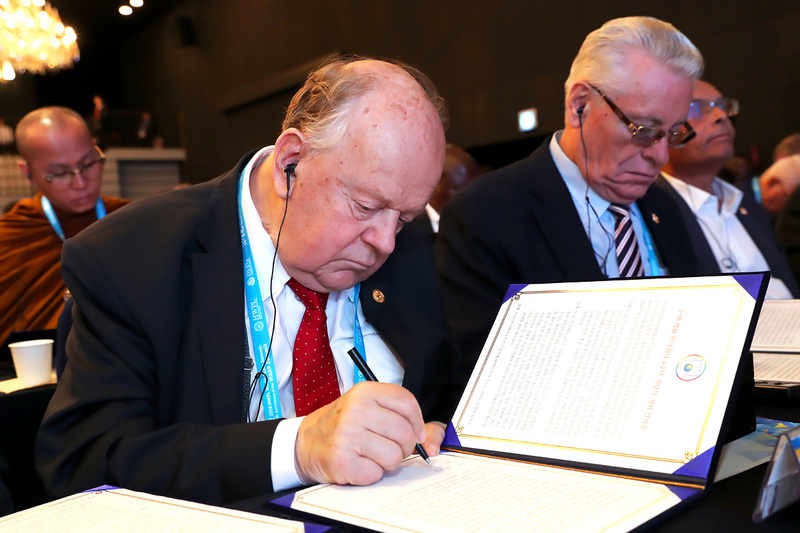 These individuals who have led their nations through times of war and regime change for approximately 30 years are now becoming the first to recognize the importance of peace and are collaborating with HWPL on the basis of their experience and knowledge. He stated, “The MOU and MOA express our intention to work together in this important issue. Sometimes we can think that this problem or question of promoting peace is difficult or sometimes we can think that is very utopian, but we shouldn’t forget that there are many international or law organizations that unfortunately today, even the UN, do not function according to the purpose for which it was established. So that brings the threats to all humanity…. We cannot ignore these facts. So, in our work together we should take into consideration this reality. With all of that, we eagerly support the DPCW and we really believe that it is a very important declaration,” reaffirming support for the adoption of the DPCW at the UN. In addition, religious leaders working with HWPL are now taking the lead in implementing measures to support and advocate for the DPCW. Through the World Alliance of Religions’ Peace (WARP) Offices, religious leaders have begun to resolve conflicts caused by misunderstandings among religions, promote a deeper understanding of the concept of peace as expressed in each religion’s scripture respectively and set a standard for a trustworthy scripture as a tool of comparison when various interpretations or opinions emerge within a religion. Expectations for the peaceful unification of the Korean Peninsula continue to rise, especially with the recent inter-Korean family reunions and the opening of the 3rd Inter-Korean Summit. However, progress has yet to be made on issues that truly require international support and cooperation such as the denuclearization of the Korean Peninsula and the official declaration of the end of war. 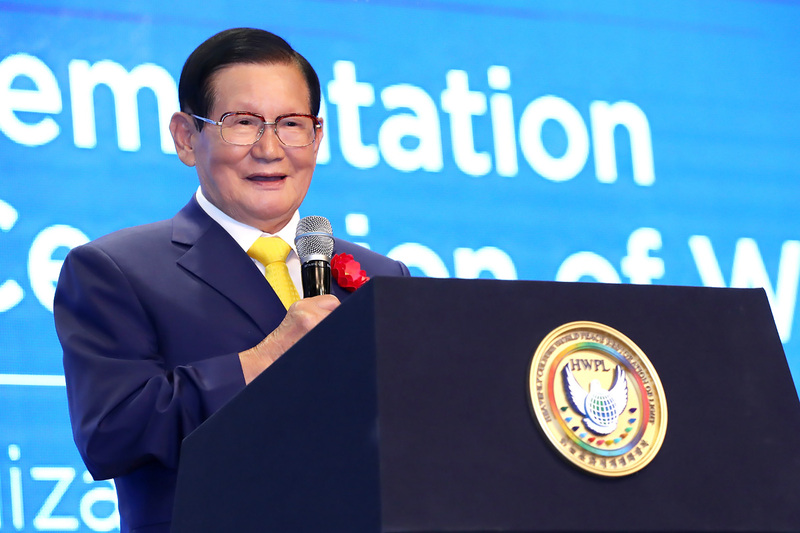 To address such issues the HWPL Peace Advisory Committee, which is comprised of former and current presidents and heads of state, legal experts, civil society organization leaders, education professionals and religious leaders, gathered together. H.E. Stjepan Mesić Vong, Former President of Croatia, commented that, "The two leaders (North and South) met for a talk. It’s a good sign and makes a statement that emphasizes the peaceful resolution of conflicts. Separated Korean families met again. It was a small, but very significant signal. For the leaders of the two Koreas, this small step nevertheless carried a very profound message that prompted sides to begin talks on normalization that could someday lead towards reunification." He also added, "The role of HWPL is now more important than ever. The political will for normalization exists on both sides. Now HWPL can find new solutions and open new processes." 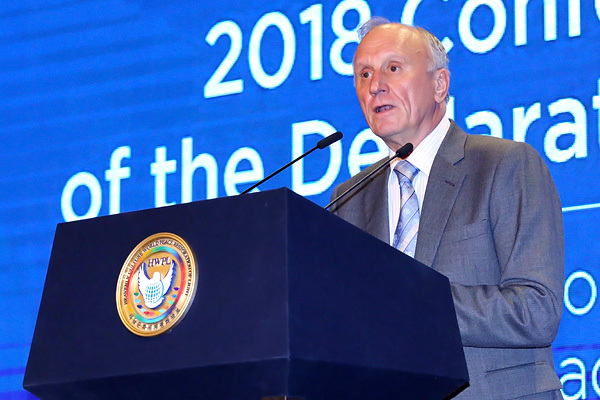 Driving his point home, he closed his presentation by saying, "I would highly recommend that the UN General Assembly puts forth the motion to include HWPL’s message for peace on its agenda at least once per year." Finally, HWPL’s Chairman Man Hee Lee proclaimed, “Korea should be unified and this work needs your help. Now the leaders of the two Koreas have shaken hands for peace. We have to figure out how to proceed with this and move forward. I think the leaders should hear your excellent presentations and statements from today. I will never forget your suggestions and the efforts that you have shown, and I will make sure everyone sees and hears your messages of peace,” promising to continue to make such achievements in the future. HWPL has set specific goals for achieving peace and is quickly implementing them. Civil society is also greatly increasing its efforts to achieve peace as it seeks to garner support for the implementation of the DPCW through various peace activities. 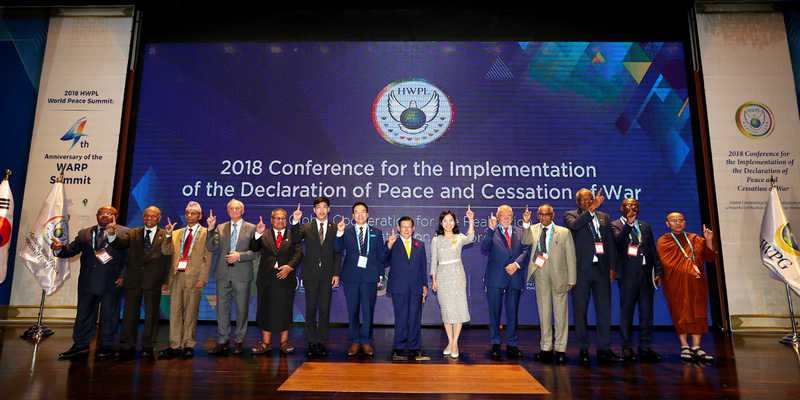 HWPL, which is creating peace alongside people from all around the world, is expected to make further progress towards the realization of peace on the Korean Peninsula.